From asynchronous code to category management, through anchored ads: here we explain how to maximize your advertising revenue if you work with Google AdSense. Thousands of web pages that we consult daily, from media to forums, information portals or blogs, get the majority of their income from online advertising. It is, not in vain, one of the oldest business models in the history of the Internet and, even today, the most profitable for many publishers. However, when one is a small site, it is quite difficult to access the advertisers of greater depth and, much less, to offer them a volume of visits that they find attractive to invest their resources in a campaign directed to our website. Thus, services such as Google AdSense emerge, a network that allows any page to start offering paid ads with all the possibilities of the search giant. And we are not only talking about the huge investment that this platform manages all over the world, but also about its numerous tools for publishers, which allow us to optimise the way we show advertising to generate a greater impact and, therefore, earn more money. It is very complex to give general advice on best practices to make better use of our AdSense ads (beyond the typical “place larger ads with visual content”), since each site is a whole universe in itself in which you must have in account the subject matter on which it concerns, the potential audience and the navigability of the web itself (both on PC and, especially, in mobile formats). But, doing a bold exercise, here are some keys that can help improve clicks ratios and conversions in the advertising we show on our website. 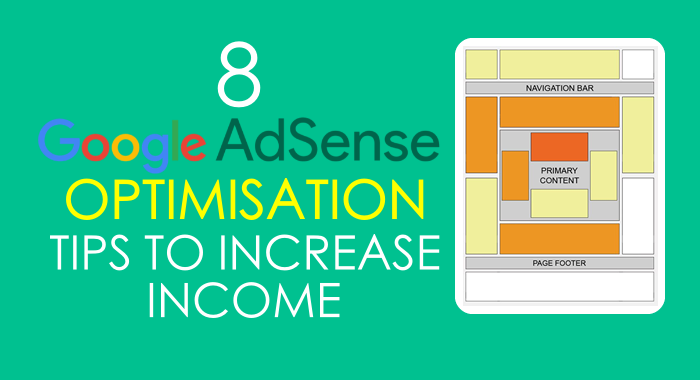 We will the 8 best tips to optimise our Google AdSense earnings on our website. Every day, more and more visitors come from mobile devices in which we can not show the classic PC banners or respect the same advertising positions due to the responsive formats that we all must have. That implies that either we adapt our portal to show different types of ads according to the reader’s device, or we risk that our side banner ends up in the bottom of the mobile web without anyone clicking on it. Some countries have a higher CPC than others. For example, the United Kingdom, the United States, Canada and Australia have a much higher CPC than Africa or India. Especially noteworthy are the contents in English, accessible by people from a myriad of places and, therefore, the object of interest of more advertisers than a page available in another language. So, if we have a blog in Telugu, Bengali, or Hindi languages, it is convenient to create a section in English that has higher CPC rates. 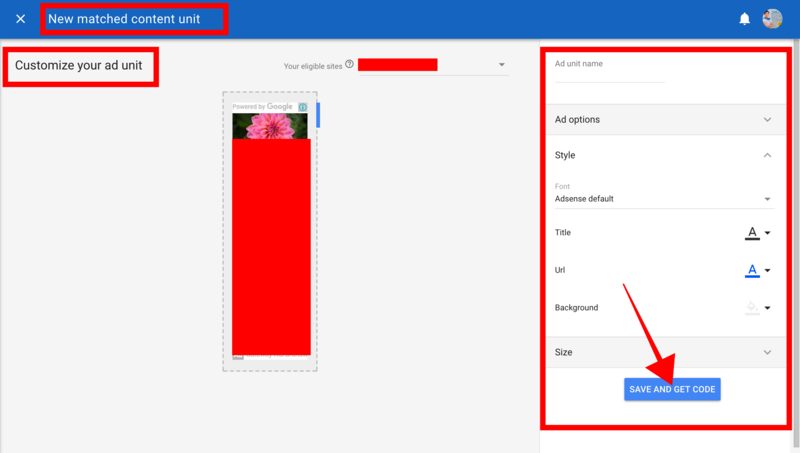 Custom channels are a very interesting option to create ad groups or individual locations to which advertisers can go directly. In this way, smarter advertising campaigns can be launched, with a much higher level of specificity and, ultimately, a greater segmentation of the available formats that will increase the advertiser’s competition for the available space. It is increasingly common to find anchor ads (also known as ‘floating ads’, which are displayed continuously in a specific place although we keep scrolling, accompanying the reading of the main text) and flow (which provide exit points within the content). The reason is that many advertisers have realized that the banners in the top positions of the web (the most valuable, as the header) are often ignored by readers eager to get to the content that interests them. With these two alternatives, we can incorporate the advertising experience within or at the same time as the consumption of the text that interests our audience, which offers better clicks and conversion rates. By default, all “secure” categories are marked as enabled, and riskier categories (such as online betting ads) are disabled. However, Google is extending functionality that allows us to play with these filters to maximize our profit potential. By default, by including as many more categories as possible, more competition will be established by appearing on our site and, thus, will increase the income that we will obtain. But we have to count on each category having a different CPC and CTR, so we have to know exactly what we are including and what is left out to get the best results. Google has spent a decade applying intelligent pricing policies that take into account not only the clicks that occur in the ads, but also the conversions that are generated in the different sites of the advertisers. In this way, advertising placed on websites that provide better conversion rates will automatically obtain higher CPC bids. However, Google does not offer conversion data to publishers, so its algorithm is a kind of secret for all webmasters. Therefore, as good managers we have to do a “reverse engineering” exercise to understand the readers’ journey and, in this way, understand what content or ways of expressing it are the most appropriate to generate those conversions. In 2015, Google introduced the asynchronous ad code to help publishers reduce the loading time of their pages by loading ads in order of appearance. Without a doubt, a good option to take into account not so much to increase our revenues, but to improve the experience of navigability. And, in the end, everything adds up, right? Google includes since 2015 a section in its monthly income report which details the invalid traffic that we derive to AdSense campaigns. Based on this criterion, the company discounts part of the income attributed to these worthless visits as a way to prevent the illegitimate use of its ad network. “The activity of invalid clicks is any click or impression that may artificially inflate the costs of an advertiser or the earnings of an editor, and for which we decided not to charge the advertiser. This includes, among others, clicks or impressions generated by an editor when clicking on their own ads, an editor that encourages clicks on their ads, automatic clicking tools or traffic sources, robots or other deceptive software, “they say the bases of Google AdSense. To prevent this situation, Google recommends avoiding sources of low quality traffic, avoid the temptation to click on our own ads, not have more ads than content, avoid that our traffic depends too much on social networks and alert in case detect any anomaly (such as, for example, a cyber attack from a rival who wants to manipulate our advertising policy). These are the 8 important tips we have to consider into our account in order to increase our earnings. I hope this article will help you to increase your AdSense earnings from your website. If you have any queries let us know them in the below comment section and we will get back to you as soon as possible to solve all your queries. 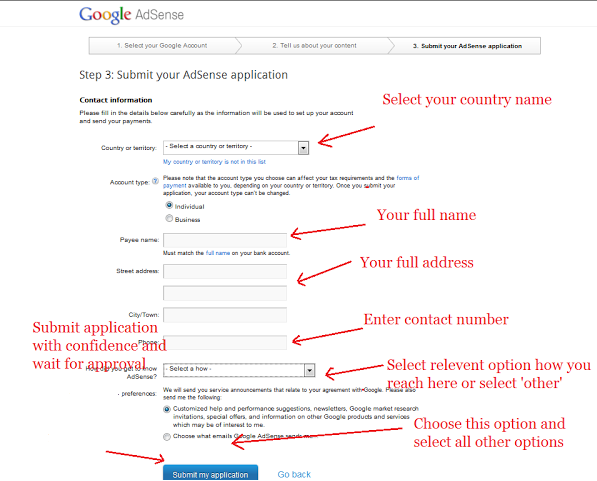 Share your AdSense experiences in the comment box. Are you looking for the best alternative to Google AdSense, where you can earn plenty of money with your website? Then I have a solution to your search. Adsterra is the best Google AdSense alternative so far. Do you want to know all the details about this Ad network? Then continue reading the article. If you are an advertiser, then this one suits you the best. This network benefits both publisher and advertiser. Know more in the below article. Adsterra is a premium Ad network which is published in the year 2013. This ad network serves both advertisers and publishers with high benefits than all other ad networks. If you are a blogger, you can earn money by placing ads on your website with decent traffic. If you are a webmaster, you can earn through the advertisements. Adsterra got quite a lot of customers with in a short span of time, thanks to their brilliant approach and services they provide to their advertisers and publishers. Just look at the stats below to know their popularity. By all this, we can say that Adsterra is the best alternative to AdSense. It is also the best platform for the advertisers who want to reach their exact audience in a wider range. How can we Earn money from Adsterra as a Publisher? By becoming a publisher, you can earn money from Adsterra. Follow these 3 simple steps to start earning with Adsterra. Whatever the network it is, our website should comply with few requirements to get approval. Your site must have at least 5000 impressions per month to qualify for pop-unders. To display banner ads, your site must have at least 50,000 impressions for a month. If you manipulate with the traffic stats with them, it leads to ban your ad account. Your website should not have too many ads on a single page is not approved. No illegal or adult content is allowed. Adsterra supports Hindi websites too. Why we have to choose Adsterra? There are many benefits we get from Adsterra as a publisher. Let us discuss them below. The main reason why we have to consider Adsterra to monetize our website is it provides plenty of flexible ad formats to monetize according to our blog traffic. You can monetize your traffic from Blogs, Websites, Facebook page. With these traffic platforms, you can earn instant income with this ad network. Coming to CPM, Adsterra provides the highest CPM rate of all the other ad networks. To experience the highest CPM rate you have to register and apply your blog to place ads. Adsterra offers a variety of ad formats to its publishers. We have some of the popular ad formats offered by Adsterra. This ranges from classic display banner ads to non-intrusive pop-udders that are waiting to be seen. 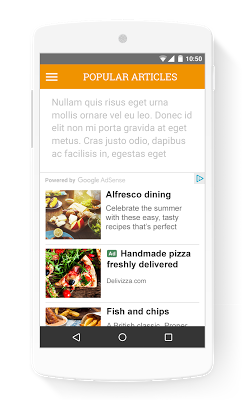 Few popular ad formats of Adsterra are Popunder ads, skyscraper ads, Direct links and display banners. Also, they offer the most popular banner sizes such as 160*600, 300*250, 728*90, 468*60, 800*440, 320*50. One of the best methods is retargeting the users. Adsterra uses the retargeting method to attract high-quality advertisers to show ads on your blogs, site or Facebook pages. Do you know what is retargeting? Well, I will explain it here. For example, your website got 100 visitors and only 3 of those visitors are converted on the first visit and the rest of them have left your website. This is very less, isn’t it? Here is where retargeting method works at its best. This is an effective way of reaching out to the reaming 97% of your website visitors who do not convert right away. Awesome right? Adsterra targets the left visitors by showing the related ads and bring them back. Here is how it works? This way you can earn more money with this ad network. Adsterra offers multiple payment methods to make easy for each and every publisher. They pay our every two weeks. The Minimum threshold is $100 to withdraw your money. For wire transfer, the minimum threshold balance is $1000. $45 is processing the charge. 8% charge for Web Money service. $1 charge for the payment through Paxum. I recommend using PayPal for all your transactions with Adsterra to keep the additional charges as low as possible. How can an Adsterra benefits Advertiser? As I have already discussed that Adsterra benefits both publishers and advertisers. Here come the advertisers turn. You may be a marketer or may be a developer looking to increase your brand or a product popularity, Adsterra can be your best choice. As an advertiser, you can get instant access to 4000+ direct publishers with Adsterra advertising platform. As an advertiser to publish your ads, you have to start bidding. They offer different types of pricing models. They are CPM, CPA, CPL, CPO, CPI (PPI). CPM is considered as the most effective ad pricing model. All advertisers have to submit their bids to place ads on Adsterra publishing platform. The impression goes to the highest bidder and their ad is served on the publisher’s blog, website or a Facebook page. All you have do is to follow the steps below. You can also get the free consultation with Adsterra professionals to discuss our advertising campaigns at a limited budget. Take a look at minimum bid prices for the popular ad formats. If you want you can consult (free) the Adsterra team and make a deposit right from your account using your credit card or via Paxum. There are other payment methods such as Webmoney, Pyza, ePayments, Bitcoin, Wire, Payoneer, YandexMoney, you can contact your personal manager that comes upon your activation of the account. 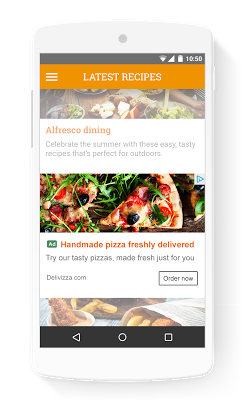 This ad network offers you an exclusive retargeting with pop-under ads for both mobile and desktop users. This method will help you to reach a wide range of your targeted audience very effectively. Also, you can display banners to showcase your ads. This is how a campaign looks like. Adsterra also offers Self Service platform to promote your business, app, product or a brand to reach a wider range of audience online on a limited budget. What Self Service Platform benefits? You can monitor the performance of every placement! Coming to Advantages and disadvantages there are few things to be considered here. The best and simple Adnetwork. A wide range of Ad formats. They offer 5% for the referral program. Supports all kind of languages. Payments for every two weeks and different payment options. Can also monetize popular Facebook pages with high traffic. For an advertiser, it offers most effective ad formats to reach a wider range of audience and increases the popularity in less span of time. Low traffic websites cannot get approved. Restrictions on joining makes difficult for the owners of the small sites. Adsterra is a great ad network to get started with. I definitely recommend this ad network if you haven’t tried yet. If you have a long-term published sites with a good amount of traffic, then Adsterra will be the best choice. If you have any queries regarding this ad network let us know in the below comment section. We will get back to you to solve all your queries. If you are already a member of Adsterrs, share your experiences with us readers to create more awareness. Which ad network do you use to monetize your website? 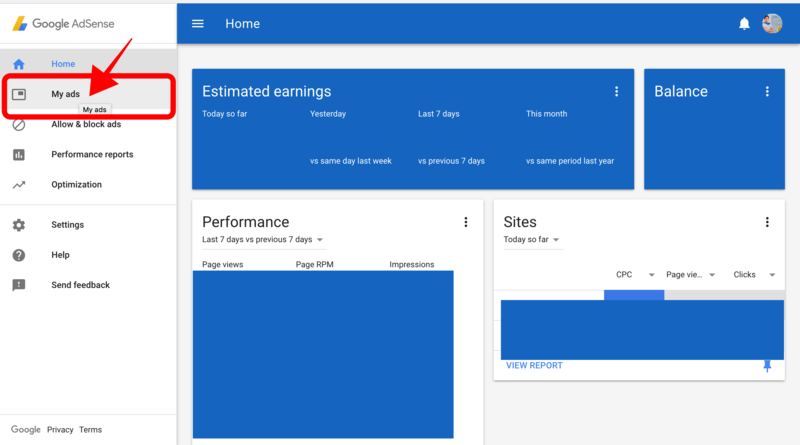 Google AdSense incredible Update: During yesterday, Google AdSense introduced Native ads, a suite of ad formats designed to match the look and feel of your site, providing a great user experience for our website visitors. We can say that this is a good update from the Google AdSense team. There are few interesting points in this update that everyone must know and implement in their website. These three ad categories can be used all at one or we can use them individually. These Ad categories are designed for these reasons. These Ad categories fit naturally on your site and they use high-quality advertiser elements such as high-resolution clear images, long titles and descriptions to attract your website visitors with great attractive experience. These native ads are built to look great on any devices such as Mobile, Desktop and Tablet. These ads are very well optimised than any other ads. Native ads are very easy to use. Ease-to-use editing tools will help us to make the ads look great on our website or blog. Native In-feed opens up new revenue opportunity in your feeds. These ads are available to all publishers. In-feed ads slot are placed neatly inside your feeds. These ads are highly customisable to match the look and feel of your feed content and offer new places to display ads. Native In-article offers a better advertising experience. 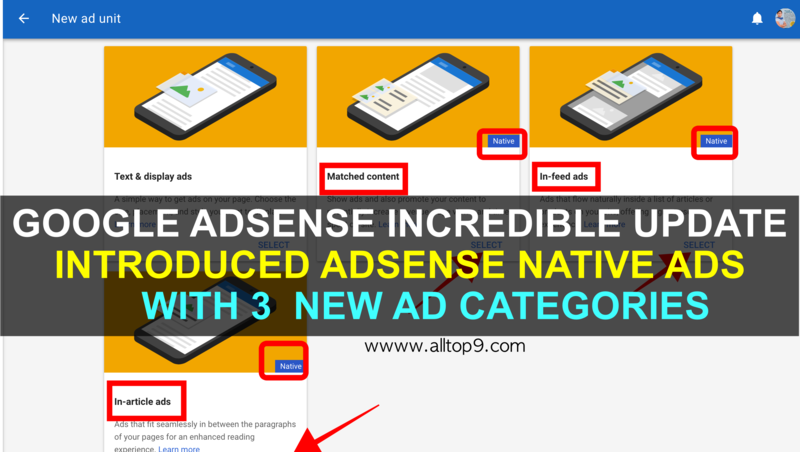 Native In-article ads are also available to all AdSense publishers. In-article ads are optimised by Google to help you to put great-looking ads between the paragraphs of your pages or articles. In-article ads use high-quality advertising elements and offer a great reading experience to your visitors. In-article ads are better for user experience. These ads are ideal for mobile. Matched Content* drives more users to your content. Matched content ads are available to the Google AdSense publishers that meet the eligibility criteria. Matched content is a content recommendation tool that helps you to promote your content to visitors and potentially increases the revenue, page views, and time spent on your website or blog. 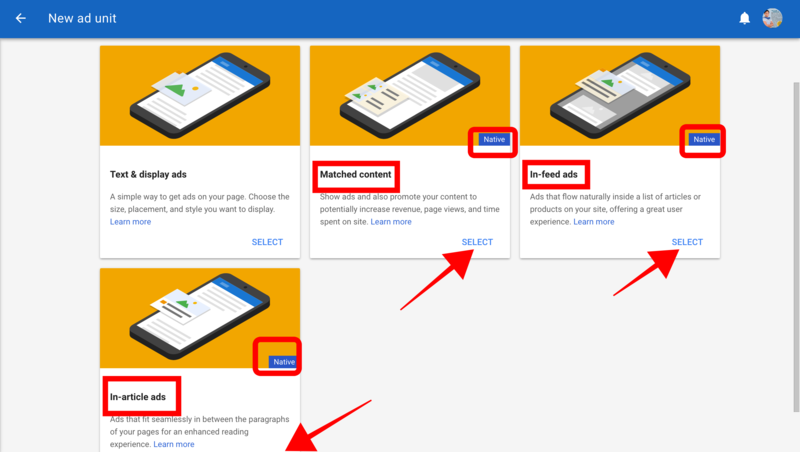 AdSense publishers who are eligible for “Allow Ads” feature can also show relevant ads within their matched content units. This leads to the creation of can additional revenue opportunity in this placement. 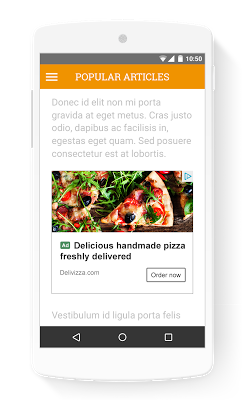 As I already discussed in the starting of this article, AdSense native ads can be placed altogether or separately. It is your wish to customise your website with Native ad experience. In-feed: Use In-feed ads inside your feed. For example, a list of article or the products. In-article: Use In-article ads between the paragraphs of your pages or articles. Matched content: Display Matched content ads directly below your articles. When deciding your native ad strategy, keep the content best practices in mind. Follow the below steps to implement the Native Ads on your website. 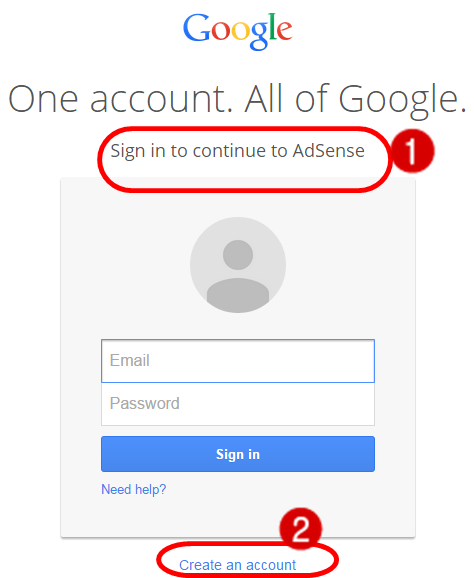 Step 1: Log in to your Google AdSense account. 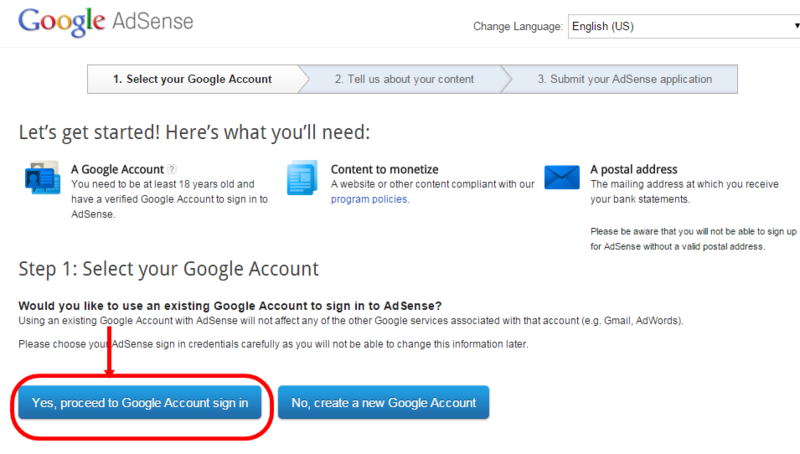 Step 2: In the left side of your Google AdSense account, you can see the navigation panel. There click on “My Ads” tab. Step 3: There you can see the +New ad unit. Click on it. Step 3: There you can see all the Native ad categories with text and display ads. There you can select any category: In-article, In-feed or Matched content. Step 4: Once you select any of the categories, you will be asked with few more options to display the ads on your website. For Matched content: Once you have selected the Matched content category, you are asked to customise your ad by giving the size of the ad unit, Style of the Ad, colour of the title and description and Adoptions. Once you are done with your selection click on Save and get the code and place in your website to display it below the article. For In-Feed Ad Category: After selecting the In-Feed category, you will be having 4 options. They are above image, Image on the side, Title above and Text only. Select any one of the options and again you will be having more options to customise it perfectly. For In-Article Ad Category: Select the In-Article ad category and you are asked to customise the ad according to your website need. Once you are done with your selection, click on save and get the code. Place that code in your website wherever you want to display the ad. That is it!. You are done with the creation and implementation. I must say that this is really an amazing update to all our Google AdSense publishers. 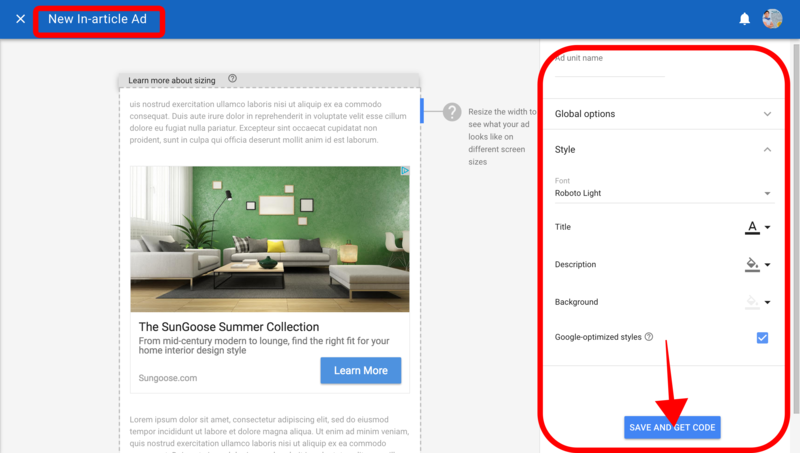 We can now customise our Google AdSense ads with more number of options than before. If you have any queries regarding the native ads update, let us know in the below comments. We will get back to you to solve all your queries as soon as possible. I hope this article helps you to increase your AdSense revenue than before. If you have implemented this on your website, share your views with our readers in the comment section below. Which Ad category is a most successful on your Website? The search engine has announced two new measures linked to its Adsense-targeted ad platform, a new page-level technology and a centre for content publishers to report infringements. Through an official statement on their blog, Google has released two important new features based on the comments provided by the publishers and focused on compliance with policies. Continue reading to know about the two new features that are announced for AdSense publishers. One of the two updates is about the implementation of new page-level policies, which, although guaranteed by the company, will allow them to act faster and more accurately to eliminate ads that violate their policies and reduce “publisher issues”. It is a measure that softens the punishment to the violators and that has arrived loaded with controversy. The main novelty of this measure is that, in the past, when a platform violated the rules of use that prohibit, for example, inserting advertisements on pages with pirate content, pornographic content or inciting hate crimes, terrorism or racism, Google deactivated all advertising on the web. However, from now on, it will only do so on the subpage on which the illegal ads are located. 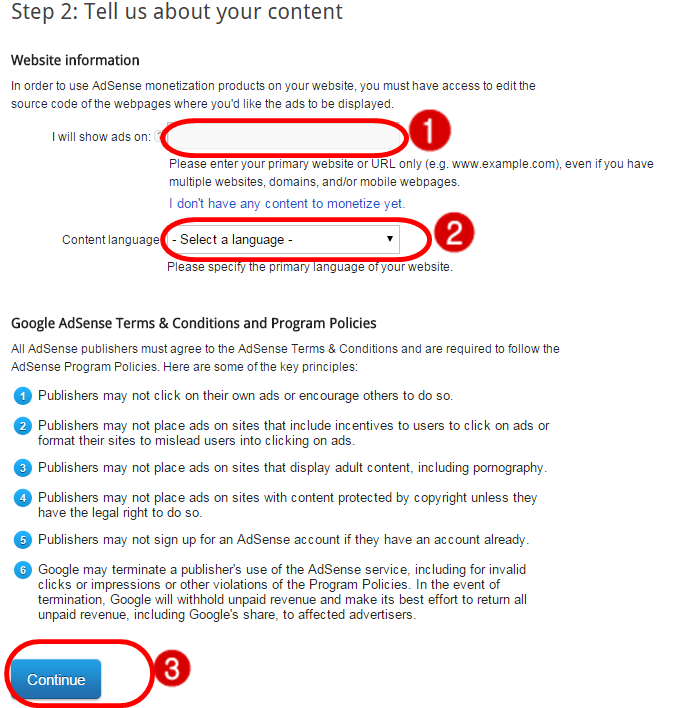 “We usually remove all ads from a publisher’s site, but as we use page-level policy implementation as the new default mechanism for content violations, we may stop showing ads on selected pages, leaving advertising In the rest of the authorized content of the site, “they said from Google, indicating that they will only penalize sites completely when there are persistent or offensive infringements, even terminating the contractual relationship in these extreme cases. The second novelty, closely related to the first, is the launch of a new Policy Center for publishers using AdSense. This centralised location will address the needs of publishers and the policies that affect their web pages. The goal of this platform is to have more transparency and that publishers can have all the information about detected infringements, including page-level action data to enable them to quickly resolve any eventualities. In this platform, the publishers will find instructions step by step and can inform Google about the resolution of any issue related to the implementation of the policies, as well as inform when they have the pages ready to be reviewed.